So like I said, I'm putting my life back together again, piece by piece, and I seem to have decided that writing it up in a blog post signifies that piece being in place for now. And if you must know, these are all the pieces and presumably my blog fodder for the upcoming months. Also like I said I'm cleaning all the rooms in my house, and certain pieces live in certain rooms. So like I cleaned the bathroom, which meant throwing out a ton of expired—I mean like waaay past their sell-by date—products, so I could actually see the skincare and makeup and hair products that I use and actually get myself to use them. Which I'm frankly not that good about if I'm stressed. I know, gross. Well, what is to be done, anything that you want to do like clockwork, you should set like clockwork, so I've been putting a little thought into this and here it is. 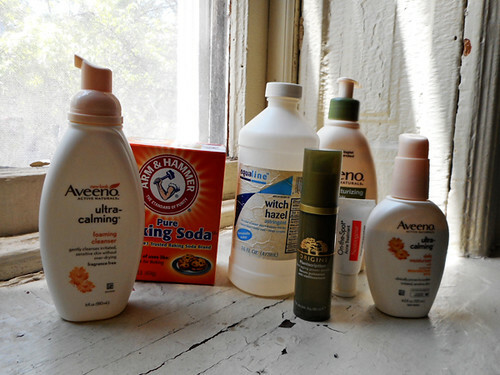 So this is my skincare routine after I shower or wash up in the morning, and before I go bed in the evening. Maybe later I'll write up my shower routine, but in the meantime here's The Week's insanely detailed How to take a perfect shower, which I mention mainly because she mentions the Salux cloth, which I didn't even know was called that. That's the scrubby I've been using my whole showering life, you get them from the Korean store a.k.a. Joong Boo Market. Dental and vision products not pictured. Not skincare per se, but I floss and brush my teeth before I wash my face so I can wash off any toothpaste that gets my face. Makes sense, right? I wash with Aveeno Ultra-Calming Foaming Cleanser, which I've used for years and years, and for exfoliant I keep a mug of baking soda by the sink and just dig up a little bit to give my chin and the sides of my nose little extra rub. I do actually prefer Arm & Hammer, I like its texture better than generic baking soda. 3. Put in/take out contacts. Because I have the cleanest possible hands after washing my face, also makes sense? I clean my contacts overnight in Clear Care Solution, which is supposed to neutralize overnight after which you can take them out of the case and pop them right in your eyes, but I have trust issues, so I rinse them in a generic no-rub solution, and actually I rub them, because I have trust issues. I just added toner to my skincare routine and after doing some internet research where I concluded somebody has a bad reaction to everything and I can't really afford to break the bank on everything expensive for my face, I decided just to stick with witch hazel and generic at that. I soak a cotton ball with that, first swipe my chin and the sides of my nose and then lightly swipe all over my face, then quick pat my face with cold tap water, then pat my face dry with a towel. Origins Plantscription Anti-aging Power Serum is my one expensive thing, I got a sample in a gift pack from my boss for Christmas and it really seemed to make my skin look better. That said, it took some talking myself into spending so much on a single product. My skin does look pretty good at the moment, but I think that might be the 17 days of antibiotics o.O. Anyway. Three pumps into the cup of my palm, then I sort of preferentially dot it into all the places where I don't really look old yet but where I could start to look old someday, and from there distribute it all over my face with light upwards strokes like all the French ladies on the Youtube videos. I was putting an extra pump on my neck with the light upward strokes, but it seemed to be irritating my scar so I stopped that. Any extra gets rubbed on the backs of my hands, but vigorously scrubbed off the palms of my hands with a towel. I can't stand having product on the palms of my hands. When I get old, the backs of my hands are going to look like Dorian Gray and the palms of my hands are going to look like the portrait of Dorian Gray. I haven't needed it lately but if I have blemishes, I dot them now with 2.5% benzoyl peroxide. I use Neutrogena On-the-Spot Acne Treatment. 6. Go put on lotion. Here I want the serum to have a minute to absorb into my skin, so I go to the bedroom and put lotion on my legs and arms. I use Aveeno Daily Moisturizing Lotion with Broad Spectrum SPF 15, ah good, I completely forgot that this comes with sunscreen. 7. Go back and put on moisturizer. Still nekkid, by the way. I want the lotion to have a minute to absorb before I put on clothes, so I go back to the bathroom and put moisturizer on my face. I use Aveeno Ultra-Calming Daily Moisturizer Broad Spectrum SPF 15 all over my face, and most days that's the end and now I go put on clothes. ETA: Meh to all that, too much process for not enough result. With my contacts cleanly in (or out), I can greasy up my fingers with moisturizer. I have a different moisturizers for day and night: Aveeno Ultra-Calming Daily Moisturizer Broad Spectrum SPF 15 for day and Aveeno Positively Radiant Intensive Night Cream because I couldn't find the ultra-calming night cream at Jewel. I wants it! I suppose I can stand to be radiant for a while. Some days, though, there is makeup! And also, there is hair. I might write those up later, too. I did go back to toner and lotion, so now this is in a little different order that I guess I will rewrite.